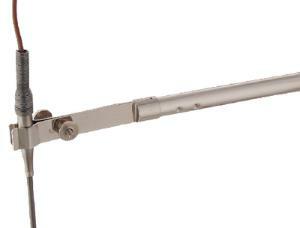 Hold thermometers and other glass apparatus firmly with this lightweight, safety-adjust clamp. Holds 6.4–12.7 mm (1/4–1/2") diameter glass tubing/thermometers up to 178 mm (7") from support rod. Tightening wing nut applies tension to the nickel-plated phosphor bronze jaws. Overall length: 210 mm (81/4"). If attaching to rods, a 90° clamp holder is required.